In 2011 I saw you live on stage at the MFVF IX, and I was impressed by your performance. After the show I talked with Tomas, his opinion and thoughts about music & lyrics impressed me a lot, too. 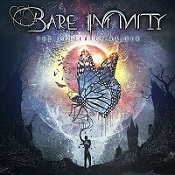 In the beginning of 2012 Bare Infinity split up, but came together again in 2013. 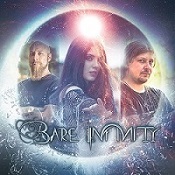 There were changes in the line up - could you please introduce the current line up from Bare Infinity at first, and describe each of you in two or three words? Tomas: Bare Infinity are Tomas and Steve Davis on guitars and of course Ida Elena DeRazza on the vocals. Ida Elena DeRazza is a singer, songwriter and actress from Rome/Italy. 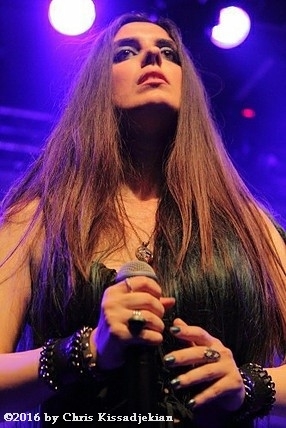 When Ida isn't on a musical stage you will always find her either on stage in theatre, TV or radio, full of energy and imagination, always working on something new, recently releasing her own personal CD Native Spirit, she definitely is the heavy metal creature of the forest. Tomas: On the guitar is Steve Davis, who apart from bandmate has been a dear friend even before joining Bare Infinity. Steve also has his own band, progressive Rock in style, named Coma Curve. Excellent music and stunning live performances always. Your CD The Butterfly Raiser <Review> was released on March 3rd, 2017, through Blackdown Music. Congratulations - the songs are excellent and I like your style of music very much! How were the reactions? Are you content with the feedback you got from the press and especially from your fans until now? Tomas: It's been a long time coming and we are super excited and happy to finally release a new album after quite a few years. So far the feedback and interest in the album has been amazing and the music is being shared and purchased more than expected which is really great! Recently thanks to our label Blackdown Music, the album's distribution expanded to Japan, being available there through two labels and within the coming weeks we will be having more distribution openings that will ensure the CD is available in physical format just about everywhere. It's great to see, a lot of work we put into this paying off. We have been getting A LOT of request to play live shows in many countries and we plan to honour all those requests within this year either on our own or as part of a larger tour. There are 12 great tracks and I have my special favourites. Let us now talk about two of them – Artemis and Robin's Eyes. Could you please tell us a little bit more about the origin of this songs, respectively about the lyrics, what is the story behind? Ida: Well, you picked two of my favourites too! A haha! Well, about Artemis: first of all, the flute you hear in the beginning is played by my dearest friend and awesome German musician Albert Dannenmann (ex Blackmore's Night), the song represents the contradictions of the human nature, the dark and the bright side inside all of us and this particular Goddess came to my mind because she is the God of the natural environment and the hunt. It's a total contradiction, isn't it? "They told you you're the one who guards the weakest ones, how can you take a bow and be an evil one? Two faces that you wear; two souls inside you joy and despair". That's the problem with human nature too: we all know something will do harm on us or on the other people and still, we can't help doing it (not all the time, luckily). The Wicca prayer in the beginning is in Italian and it's dedicated to the moon, Artemis is the goddess of the moon too. Finally, I think it represents both Italy and Greece, considering we have the same mythology (we Latin stole it from them, but don't tell anyone lol) and the Celtic flair is a homage to the music I come from. Ida: About Robin's Eyes: I was shocked when I heard of Robin Williams' death, not only because he's my favourite actor of all times, but also because I felt some kind of empathy with him, especially to his wonderful and incredibly expressive blue eyes (that's the reason behind the title). He was terribly depressed and most of the people around him felt weak because they had no idea. Depression is a weight we carry on our back, but it's easier if we share this weight with somebody else. That's what this song is about. How would you describe the music resp. 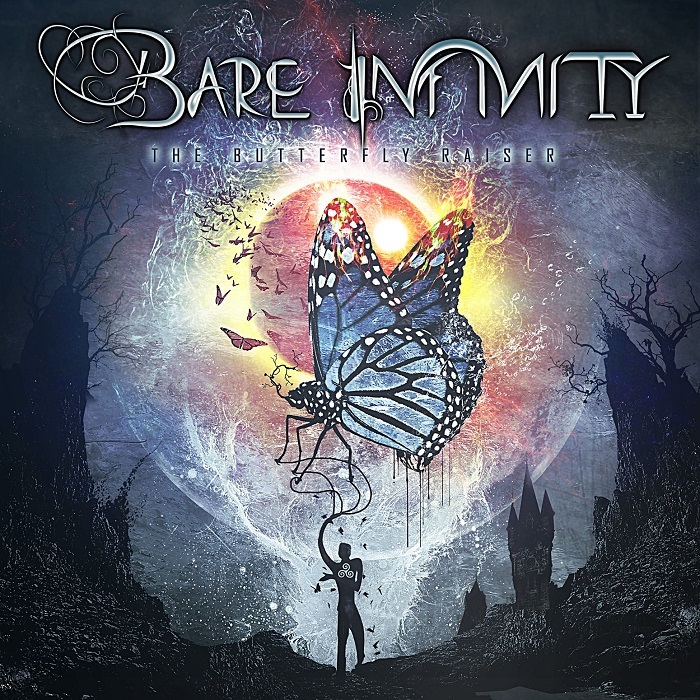 the sound from Bare Infinity in 2017? What are – seen on a musical level – the greatest differences between The Butterfly Raiser and the EP The Passage (released in 2011)? Tomas: I think from a musical and production level The Butterfly Raiser and The Passage, have nothing in common. It might as well have been two different bands. The time during the band split-up was needed and was crucial to evolving musically. Writing music with Ida has opened a whole new chapter of opportunities and styles that can be played and that is why The Butterfly Raiser is so diverse in the songs on it. We have songs that are more symphonic, closer to our first album such as Orion's Light, we have songs with folk elements like Artemis and The Butterfly Raiser, that were never used before, and now thanks to Ida's background and style we can add more and more elements, as well more up-beat and progressive songs like In Desertis and Sands Of Time, to Hear Me Out, a more modern sounding themed song. I believe with this album we have found our sound and identity in being able to write such a wide range of styles and songs yet at the same time not be out of place and all be part of the same album. From the musician's point of view, could you please tell me: what were the most important experiences and impressions for you during the songwriting and the recordings? Tomas: I was very lucky to have worked with people like Max Morton and Jacob Hansen on the production because we were able to communicate so well that the mixing phase was one of the fastest I have ever done. In that respect the main lesson was: if you don't “click” then it's not gonna be a success, so choosing the right people that you can communicate with is essential. Tomas: As for the songwriting process, as Ida will also tell you, again the process was very fulfilling. The songs we had both written were so similar that we literally just merged our compositions and within 1-2 recording tests we had the songs almost complete, so again it's all about the right person. Tomas: However together with the good experiences as mentioned above, there are always the bad ones that also provide very good lessons for the future, one of which was to work with people always with contracts. Sadly throughout the preparations for the album, even before the recordings, we worked with some very unprofessional people that set us back a number of times. No musician should be shy or feel like it’s taboo to demand what has been agreed on to also be signed in a contract. If both parties want to get work done, you should not fear asking for contracts before work takes place. Tomas produced most of the songs together with Max Morton, Jacob Hansen is mentioned as producer on two tracks. Greece, Ukraine, Denmark – how did the cooperation with these two gentlemen come about, did you both know each other before? 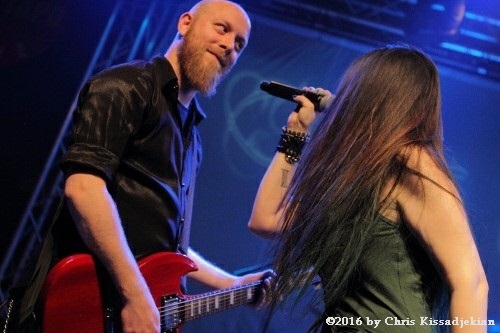 Tomas: I knew Jacob from his work with Amaranthe and when we were preparing our “comeback” song Race Of Destiny, both I and Ida wanted a bombastic sound for the song and to make sure her voice came out strong over the heaviness of the guitars, so Jacob was the perfect producer for the song. Right from the start he put his signature sound to it, and it all fell into place very fast. Jacob also mixed and mastered the song The Devil's Call that was originally planned as a single release. Tomas: During the time of the album's crowdfunding campaign, as the rest of the album songs took their final shape, I decided to shift the sound I wanted for the album and so I got in touch with Max Morton, whose productions I had been following for some time. As with Jacob, our communication and cooperation kicked off immediately and the result was amazing from the very first test mixes. With Max I think I found Bare Infinity's sound which I've been searching for, for some time! There will definitely be more work released with Max Morton in the near future. You worked together with four guest musicians - Albert Dannenmann (Flute), Ioannis Maniatopoulos (Bouzouki) plus the singer Max Morton and Sarah Wolf. How did you manage that - via internet with e.g. Skype and mails and/or face-to-face meetings? Did the guest musicians record their parts in different recording studios? Tomas: Guest musicians - I wanted them to bring something special that we could not replicate as a band. The song Sands Of Time - its original version did not have the Bouzouki in it. It was a heavy song but there was something missing. I've been a fan of Tri State Corner for a few years and I've always wanted to be able to add a traditional Greek instrument into Metal and so I decided to experiment with it on the song, and realised that it would be ideal, and the best person to bring the feeling of playing was Ioannis, who plays the Bouzouki in Tri State Corner. I got in touch with him and he was more than welcome to record for us and was a fantastic person! He recorded in Germany based on some pilot tracks I sent him and sent the files to us via internet. Tomas: A kind of similar story is behind Max Morton and In Desertis. In its first version I sang the vocals but I didn't like the balance of my voice on the song. Max has a fantastic voice and in the range of the song, so I asked him to be our guest. He took on the song and made it what it is, adding beautiful vocals harmonies with Ida's voice that create a balance I didn't expect! It came out amazing. Tomas: Sarah - we know each other a few years through her band AfterTime where she sings! The song Orion's Light which she sings with Ida came about within days. She recorded her vocals at a studio in the USA and sent me a lot of files with various variations and experiments she had done with the vocal line I had written for her and it was great. She put a lot of fresh ideas into it and that gave a lot of boost to the song. Her voice tied with Ida's very well and the song came out great! It is one of my favourite songs on the album! Tomas: Albert and Ida have been friends for many years! When the song Artemis was written it was because of Albert's flute that gave the basis for the folk elements. I had his flute recording before the song was arranged, and so it gave great inspiration in completing the song. Throughout the song we kept a strong folk element as not to loose the beauty brought about by Albert's melody and Ida's lyrics. One of the songs I really enjoy playing live and can't wait to play again on stage. Ida Elena, you wrote the lyrics. Could you please tell us a bit about the writing process - what are the most important inspirations for you? Do you have to be in a special mood and/or do you need special ambience to be creative? Ida: Well, when in Rome (but also when I am in Germany, I'm based in Baden Württemberg, I love its landscapes!!) I live in front of the woods (literally) and the only "noises" I hear come from there: it's the perfect mood to write. I tend to watch the nature and get the inspiration from there, because nature speaks to all of us, while people tend to lie about themselves to be "accepted" by the other (that's human nature, it's not our fault), but also this aspect helps me a lot with the writing process, because I try to read between the lines when I talk to somebody, and it's pretty interesting when I have the feeling somebody is telling me a lie: this inspired me The Devil's Call for example! Ida Elena and Tomas composed the music - did your team work work very well straightaway from the beginning or did it take some time to become attuned to one another? You surely will showcase the songs live on stage pretty soon. Do we have a chance to find Germany listed in your tour-schedule, too? Talking about Rock & Metal music in Radio and TV now, how does this work in Greece - do you get a lot radio airplay and TV-appearances? 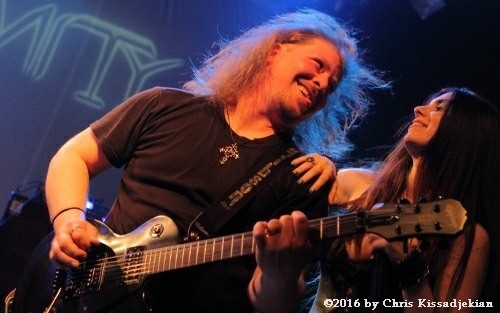 Tomas: Greece has a flourishing online radio and webzine presence for Rock and Metal. TV unfortunately is very limited when it comes to Metal in particular as only one TV show is still on Air. Moreover due to the internet I think fans have turned to more online services to listen to new music and releases. Since our album's release we have been getting quite a substantial air time on radios and that is bound to grow within the next couple of weeks as our album's distribution expands. In Italy, Ida is a regular on many TV and Radio shows whether it's promoting Bare Infinity or her personal album. She is a busy butterfly :) You can often catch her on Facebook, live streaming many of these events. Tomas: For me, I think 3 bands played a definitive role in the music I write and listen to. Iced Earth is the reason I picked up a guitar, and also shapes the sound I like on guitars. From the fast riffs to the drumming, Iced Earth's album were like schooling on Heavy Metal for me. Tomas: Nightwish was and is the only band I became a superfan for, the reason behind the keyboards and melodies in Bare Infinity's songs after all I started off in music as a keyboardist and most of the songwriting starts of with strings and piano. Tomas: The band however that I owe most of my music love and my passion for female vocals is Roxette. From the way I compose songs to the way they are structured it's based on my love for Roxette. Despite going through various phases ranging from listening and playing in Black Metal bands till today, I still listen to Roxette and draw inspiration and songwriting ideas from the songs. Steve: I have 5 guitars so far! But my favourite is my Epiphone Goth Les Paul Studio with Floyd Rose just because it was a love at first sight. Which amplifying equipment do you prefer and what effects can be found on your pedal boards? Tomas: I used to use a Line6 Pod for sounds however with the new technologies I am still searching to find something I like and can be used reliably. The only pedal I use for recordings and shows is the Morpheus Drop-tune pedal as Bare Infinity's songs on each album are on a completely different tuning and in order to play them all I need to be able to switch tuning for every song. The drop-tune is a lifesaver. Steve: I prefer the orange Thunderverb Amp Head because it has never disappointed me. As for effects I use a Digitech Whammy and depends on the stage sometimes I use a Boss GT-100 or Helix Line 6. Social networks like e.g. Facebook, Twitter and Instagram are almost indispensable for bands nowadays. What do you think about it, how important are they for you? Do you maintain your accounts by yourselves or do you have a social media team? Tomas: Nowadays you can run everything from one page, and whether some people like it or not, for now, Facebook is the way to go as far as marketing goes. Until recently accounts were maintained by the band however it is getting increasingly harder to keep up with everything and so recently we gave the managing of most accounts to our label's team. We do keep on them as well whenever possible and try to reply more personalised whenever it is needed but maintaining social media accounts is a full time job nowadays and we don't have enough time. Thanks for your time. We wish you all the best and much success with The Butterfly Raiser!